I made my first trip to Prague in the summer of 1984. I was a student at Columbia University in New York at the time. My reason for coming was almost purely accidental. My roommate and best friend from those days, Matt, had spent the summer studying at Jagiellonian University in Kraków. I was stuck in a dull, 9am-5pm job in New York and looking for an escape. I figured I'd catch a flight to Europe, travel over to Poland and spend a week or so there. After that, the two of us would travel down to Prague together for a few days and hang out. That was the plan. In practice, it turned out very differently. Prague Castle as seen from Charles Bridge, pictured here in the 1980s. I've always loved this photo because it captures so well the mysterious mood of the city. Photo by Per Ryolf. 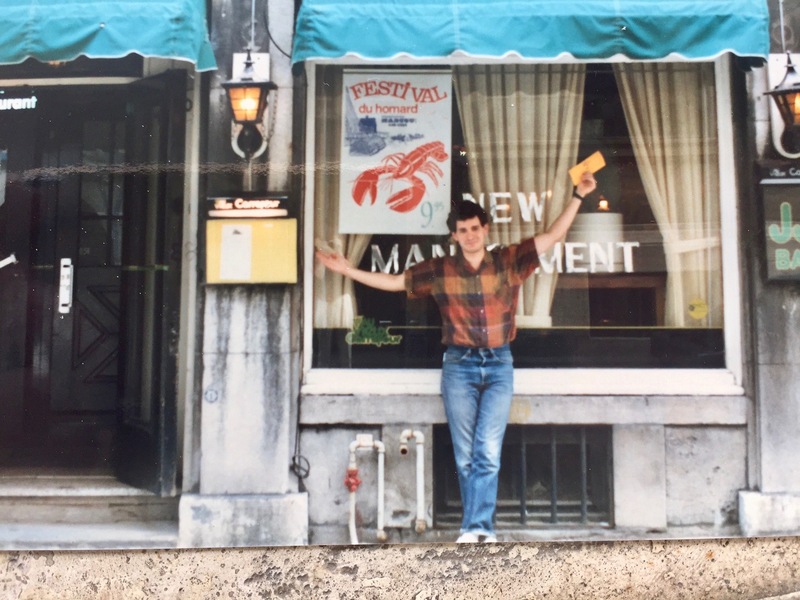 Posted in Life In Prague, Tales From The Past and tagged Columbia, communist, Czechia, Czechoslovakia, Krakow, Poland, Prague, retro, Solidarita, Solidarity. 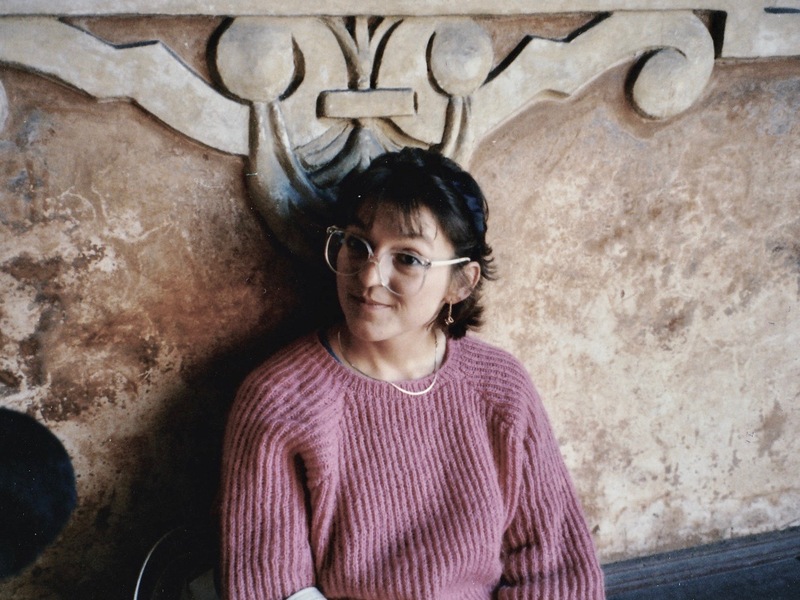 My friend Bożena, pictured here in Kraków in 1989, five years after we met. Photo by Mark Baker. 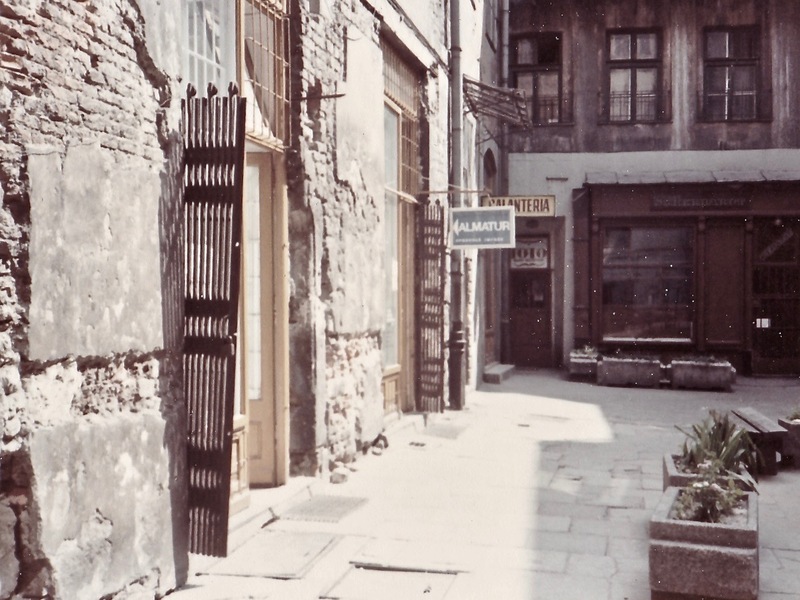 The scruffy entrance to the 'Almatur' student travel agency, off the central square in Kraków, where I met my friend Bożena in 1984. Photo by Mark Baker. 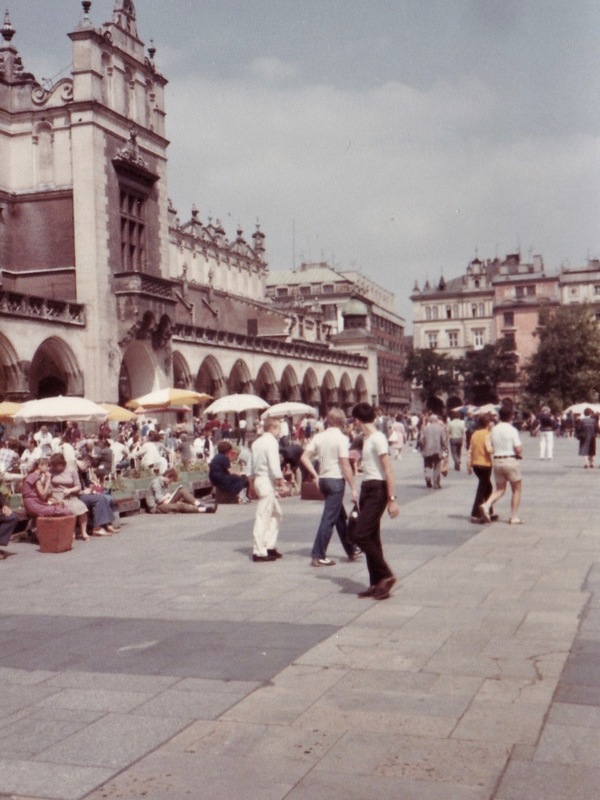 Kraków's main square in 1984. Even then, it was a magnet for tourists, though back then most visitors came from within Poland. Photo by Mark Baker. 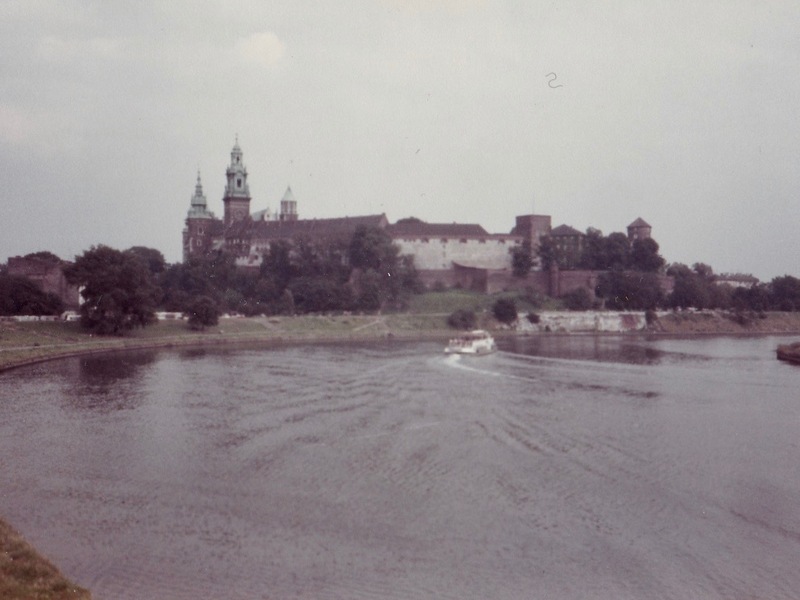 Kraków's Wawel Castle, seen from a distance, during the summer of 1984. Photo by Mark Baker. The Poland part of the trip went smoothly. I arrived in Kraków and fairly quickly found lodging with the family of a Polish college student, Bożena, who was working for a youth travel agency near the city’s central square, the Rynek Główny. I had popped into the agency to find a room, but unfortunately for me Kraków was booked solid that summer. There wasn’t a hotel or hostel to be found anywhere. Bożena had kindly offered me a spot on her family’s sofa in the industrial suburb of Nowa Huta, and that was that. She was also smart, attractive and spoke excellent English. I rarely get that lucky in life, and it was a good start to the trip. Bożena would later feature prominently -- and unexpectedly -- on this bizarre first journey to Prague. That week in Poland I divided my time between Bożena and her family, and Matt and his friends. Most of Matt’s fellow students were Americans who, like the two of us, were studying history or international relations somewhere back home. I remember all of them being pretty cool, and even being slightly jealous of Matt that he’d had the opportunity to hang out that summer drinking beer and playing guitar in the crowded student dorm they were all staying in. When it came time to say goodbye to Poland, Matt and I and some of Matt’s new friends from the Jagiellonian program boarded the train in Kraków for the overnight trip to Prague. The plan was for the two of us to hang out in Prague for three days and then take an overnight train to Nuremberg in Germany. From there, we would connect onward to Luxembourg, and eventually Paris, for the flight back to New York. By sheer coincidence, Bożena was also planning to be in Prague that week. The summer of 1984 marked what authorities were celebrating what I hazily recall as some kind of anniversary of "Polish-Czechoslovak Friendship.” For the week, Bożena and hundreds of other Polish students would spend their daylight hours stuck in official, formulaic cultural exchanges and their nighttime hours getting wasted with each other at the Charles University dormitories next to Prague’s giant Strahov Stadium. Bożena and I hadn’t made any concrete plans to meet up, but I kept the possibility firmly in mind. In fact, I had planned to head up to Strahov to look for her the first chance I got. 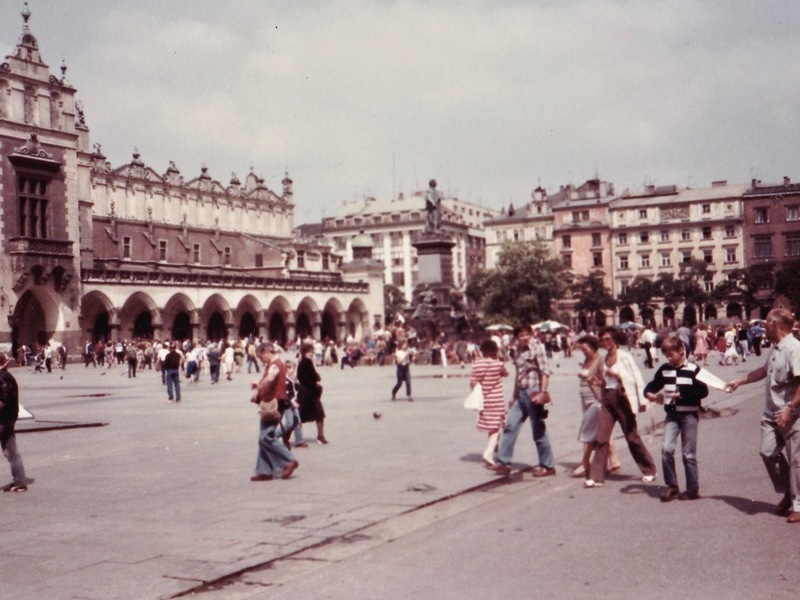 Kraków's main square, looking very 'retro' here in this shot from my trip in 1984. Photo by Mark Baker. 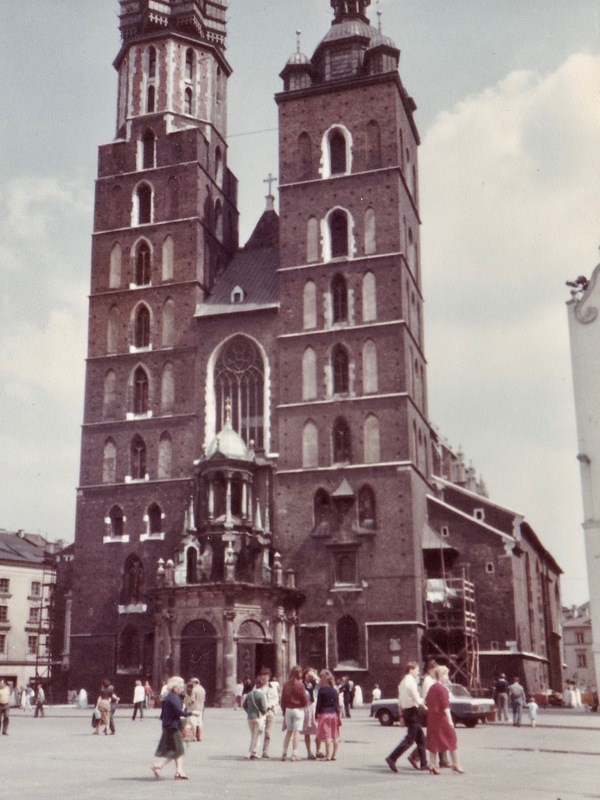 Central Kraków's St Mary's Cathedral on the main square, pictured here in August 1984. Photo by Mark Baker. 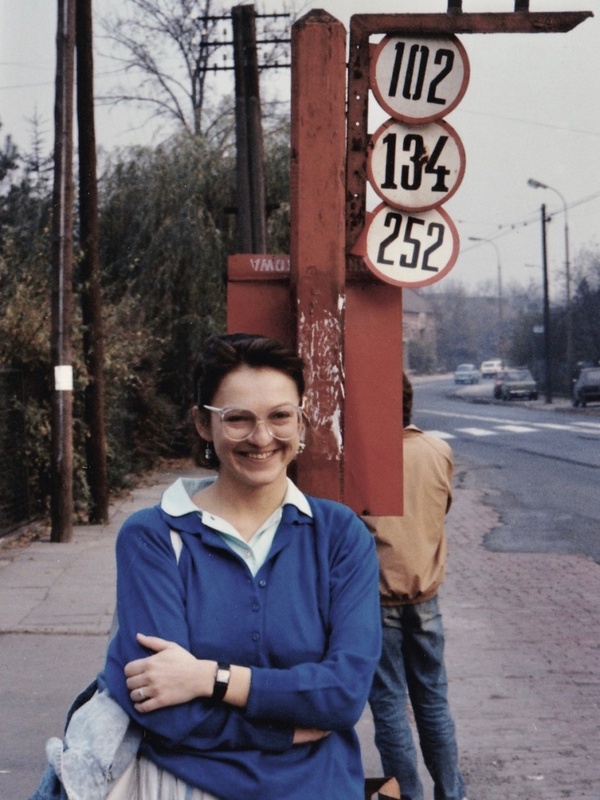 Another shot of a smiling Bożena -- this one taken in 1989 on a later trip to Kraków. Photo by Mark Baker. From Prague's main train station, Matt and I stumbled over to the official "Čedok" hotel-booking office, on Panská street near the Old Town, where it was mandatory for foreign arrivals in Prague to register and book a hotel room. These days, Čedok is just another ordinary travel agency, but back then it was a rather sinister place, looking more like a police station than a booking office. The procedure was that you’d get in line, hand over your passport to some stern-looking old lady, answer a lot of questions about why you were in Prague, and finally – if everything went well -- end up with a hotel assignment. You didn’t have much choice in choosing a place. We were students at the time and naturally looking for the cheapest room available. In the end, we were given a voucher for a twin-bed double at the Hotel Solidarita (these days known as the “Hotel Fortuna City”), a rather soulless high-rise hotel situated in the grim, outlying district of Strašnice, 5 kms (3 miles) east of Prague’s Old Town (see the map plot, below). The lady at Čedok informed us that we had until the end of the day to go over to the hotel and claim our room. We felt pretty satisfied with ourselves. 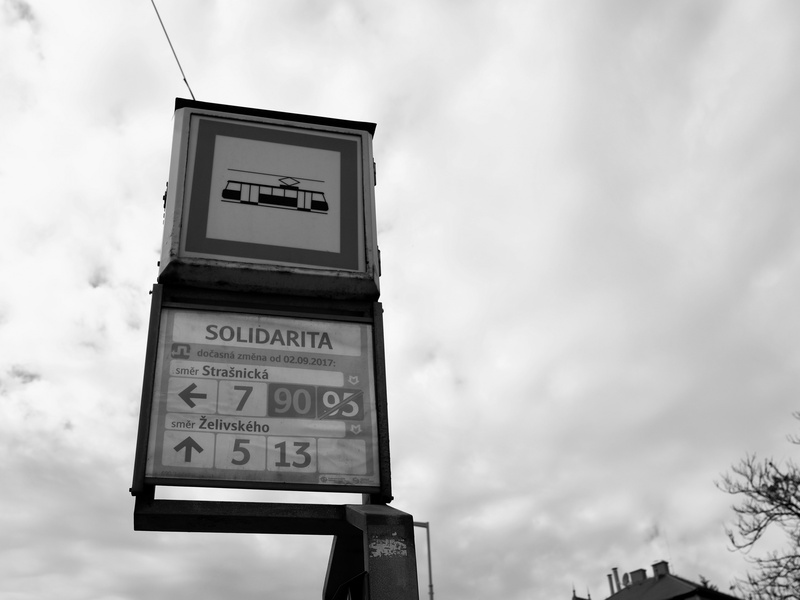 True, the hotel wasn’t in the center, but it was available, affordable and even (ironically) called the “Solidarita.” Back in 1984, the Solidarity Trade Union in Poland was a big deal and at the center of Poland’s anti-Communist resistance. Naturally, the hotel wasn’t named after the trade union (that would have been out of character for Czechoslovakia’s rigid Communist government), but we considered it to be some kind of good omen. Okay, now here’s where the story gets weird. 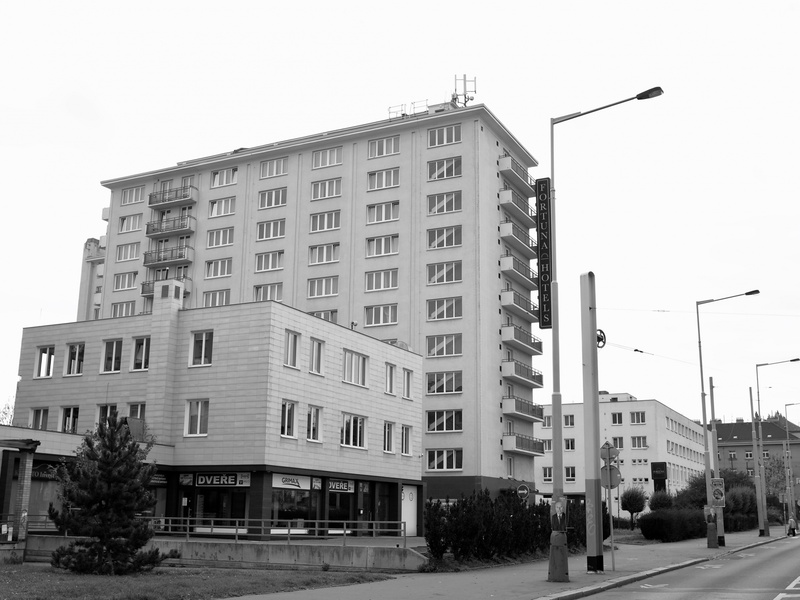 The old Hotel Solidarita, the first place I ever stayed in Prague, now known as the Hotel Fortuna City. Pictured here in 2017. Photo by Mark Baker. The only marker these days showing the Hotel Solidarita's old name is the name of the tram stop out front -- still called 'Solidarita'. Photo by Mark Baker. Me with my familiar worried look, sometime in the mid-1980s. 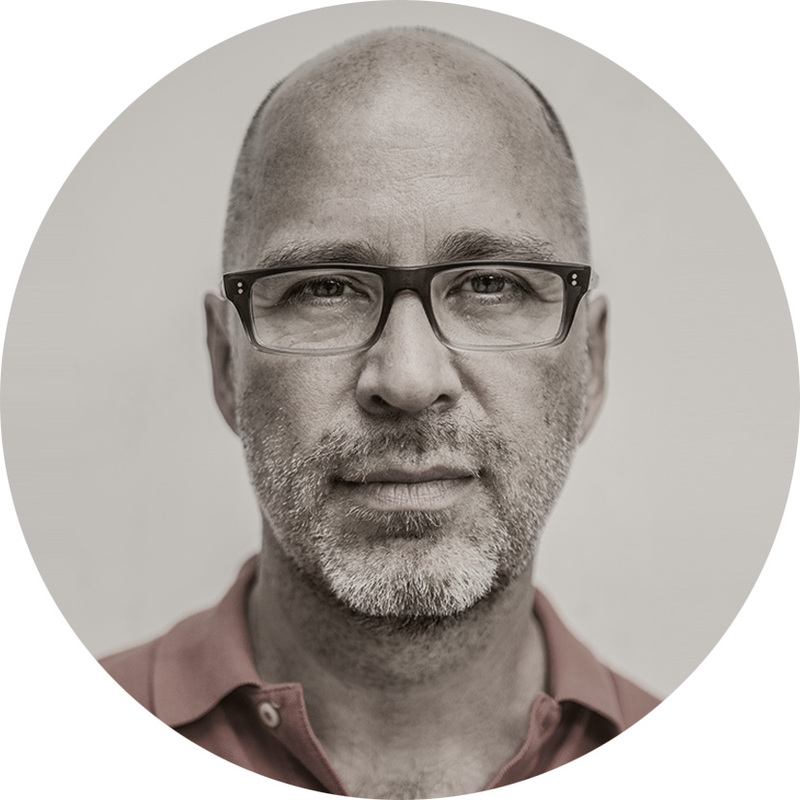 Photo by Delia Meth-Cohn. After Čedok, Matt and I walked around the center of Prague for a while to wake up and get our bearings, but I was still tired from the overnight train trip. At some point, I gave in and told Matt I would head over to the hotel, get the room, and take a nap. I’d meet up with him back at the hotel later that evening. He seemed fine with that. He said that he planned to walk around some more and maybe hook up later with some of his Jagiellonian friends. That was the last time I’d see Matt for three days. So, that’s basically how it all went down. I went over to the Solidarita, checked in at reception, got the room, and took a nap. I hung around the hotel the rest of the day and evening, waiting on Matt to return, but he never did. I vaguely remember eating dinner at the hotel restaurant and turning in for the night, fully expecting that at some point Matt would appear drunk at the door, tell some wild stories, and crash for the night. Imagine my surprise when I woke up the next morning and Matt’s bed was empty. There was no sign of him anywhere, no backpack, and no trace of anything. I suppose I should have been more concerned and reported his disappearance with the local police or U.S. Embassy. After all, in those days, Czechoslovakia was a hostile foreign government, and all kinds of spy-vs-spy shenanigans were going on. Initially, though, it never occurred to me that something bad could have happened. In fact, I remember thinking just the opposite. I was irritated that Matt had obviously stumbled onto some great party, crashed for the night, and couldn’t be bothered to let me know about it. After breakfast, I left Matt a testy note in the room and went out for a day of sightseeing in Prague. The city was undeniably beautiful, but it was also quiet, empty and more than a little bit spooky. There were very few tourists to be seen and not really all the much for visitors to do. It was the kind of place where you hear your own footsteps echo off the sidewalks; where you can't help shake the feeling that someone is watching you. I returned to the hotel in the afternoon and again found the room empty. Matt had truly disappeared without a trace. That evening, I decided to go across town to the dormitories near Strahov Stadium to look for Bożena among the visiting Polish students. I had no idea what to expect, but since it was some kind of hyped-up political event (an anniversary of fraternal Socialist friendship! ), I figured it might look suspicious for an American to be lurking around the grounds. At the door, I polished up my best schoolbook German and pretended to be a visiting student from East Germany. To my surprise, the ruse worked and the guard let me inside. It was no small feat to locate Bożena amid the many hundreds of Polish students milling around. No one seemed to be taking the political stuff very seriously. Polish-Czechoslovak friendship looked more like just another excuse to drink beer. I first asked where the delegation from Kraków was hanging out, and once I found them, I asked for Bożena. No one had heard of her or seemed to know her, and then suddenly at one point, I heard her voice. In fact, she was standing right in front of me. We spent the next 12 hours together, until the next morning, though my memory has only scattered pockets of real clarity. I remember we talked into the night the way students do; we talked about our studies, about our futures. We were from opposite sides of the Iron Curtain, of course, which lent a kind of cinematic poignancy to the conversation. In actual fact, the dialogue probably wasn’t as brilliant as I’d like to think, but I came away very much smitten with Bożena and thinking she was one of the most amazing people I’d ever met. We must have kissed (how could one not under those circumstances? ), but here my memory truly fails me. We probably didn’t have all that much privacy in her dorm room anyway. In the morning, after an emotional goodbye when I wondered (with good reason) if I’d ever see her again, I snuck out of the dorm and made my way back to the Solidarita. Yeah, I thought to myself, Matt may be having the time of his life, partying with his friends and hanging out with dissidents, etc, but I’d just had a pretty amazing experience of my own. Prague was working its magic in unexpected ways -- and maybe for both of us. 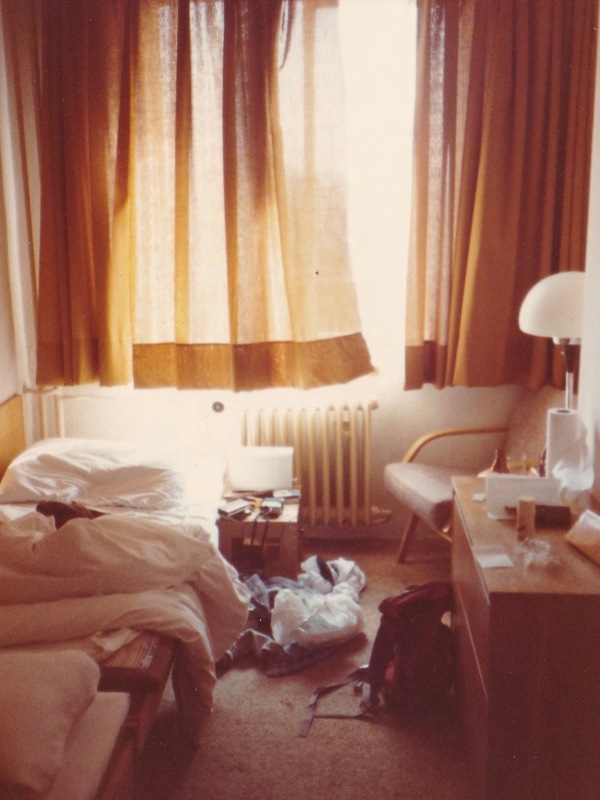 The interior of my room at Prague's Hotel Solidarita in 1984. Matt never showed and his bed remained untouched. Photo by Mark Baker. 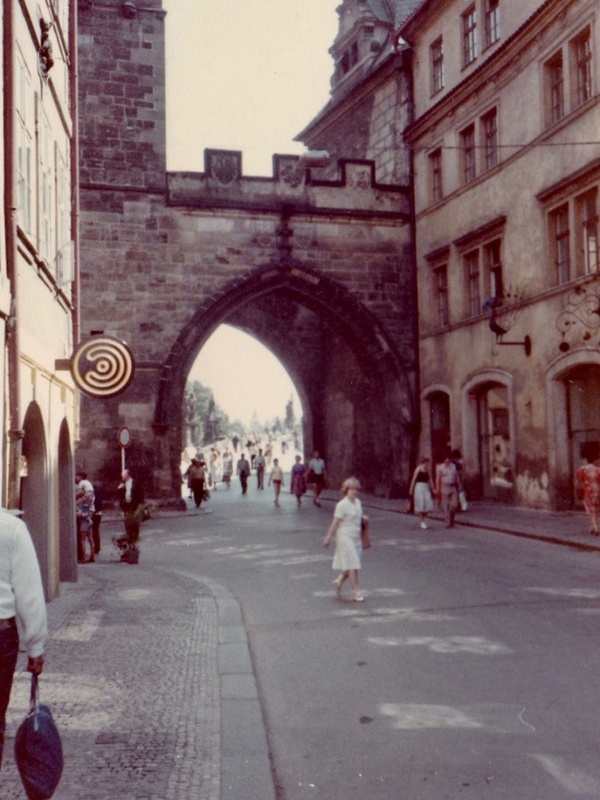 The approach to Prague's Charles Bridge in the summer of 1984. I can't recall now why I decided to take this photo of Prague's Charles Bridge (from the Mala Strana side), but I could have shot it on the walk back from the Strahov dormitories to the Hotel Solidarita. Photo by Mark Baker. 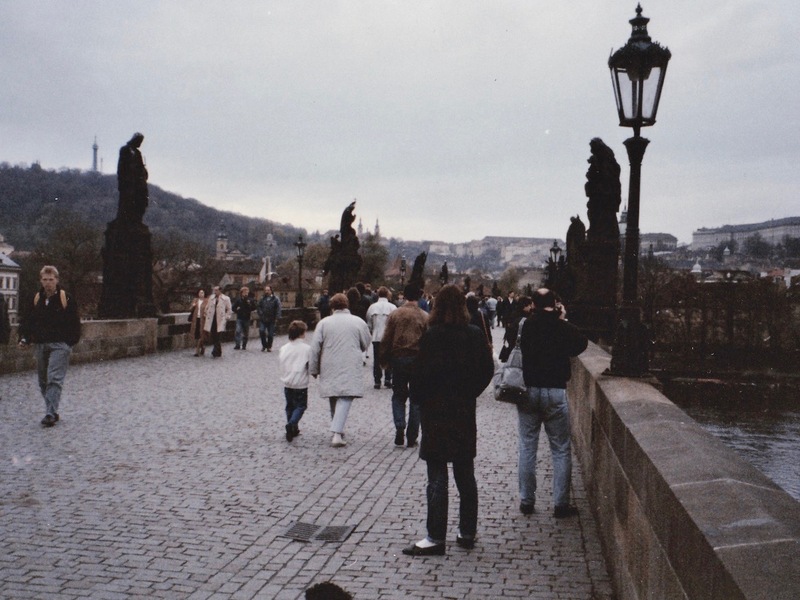 A photo of Prague's Charles Bridge in the 1980s. This was from a later trip, but the bridge and the vibe were both still similar to how they were in 1984. Photo by Mark Baker. 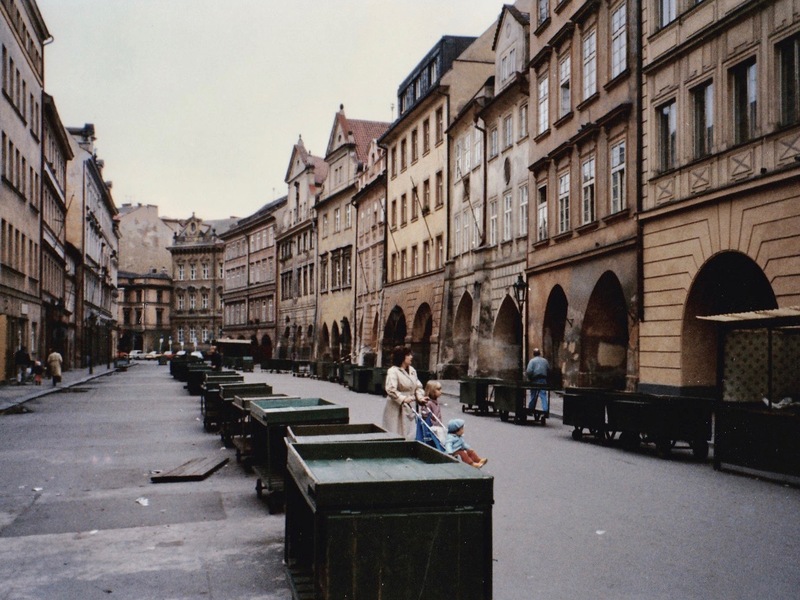 Prague's Havelský trh (Havel Market), near Old Town Square, in the 1980s. Back then, Prague was a much quieter and much lonelier city. I spent most of those three days in the city simply wandering around from street to street. Photo by Mark Baker. When I found the room empty and Matt still unaccounted for on my return, though, the worry really did kick in. Sure, I reasoned, you could get caught up in a party or something else for a night or a day, but two days without any sign or any note was highly unusual. I spent most of that morning and afternoon napping fitfully, trying to catch up on my sleep from the night before. I probably went out of the hotel again that day, but I can’t imagine what I would have done. The third and final morning of my stay arrived and, once again, there was still no sign from Matt. I ate breakfast at the hotel buffet, packed my things and checked out of the hotel. As I had done each of the preceding two days, I asked at the reception desk if anyone had left a note for me or tried to contact me, and once again the staff said no. The plan that day was to catch the 8pm overnight train for Germany, and I figured that if Matt was okay, I’d see him that evening standing on the station platform. Of course, I had no idea how it would turn out. I spent those last hours walking around the center of Prague feeling a bit bored, a bit lovesick, and a bit worried. Over the years, in different situations and stages of my life, I would find that’s an emotional cocktail that suits Prague unusually well. As the departure time approached, I headed over to the main train station and hoped for the best. After consulting the big departure board to find out which platform the train was leaving from, I walked through the station and climbed up the stairway to the train tracks. It was well before 8pm and the platform was only partly filled, but as I looked down the line to the opposite end of the platform, there I spied him. Matt was alive, and he looked perfectly well. My mind flooded with a mix of emotions: there was relief of course, but also a healthy dose of anger and disappointment. Why had my best friend not bothered to tell me that he was staying somewhere else, had other plans, not to worry, etc? It took a while for both us to calm down. We boarded the train, found seats and hashed it all out. In the end, we figured out what happened, and the answer was agonizingly simple. When I had arrived at the hotel on that first day and requested our room, the reception desk gave me one room. When Matt arrived later that day with the same request, the reception desk gave him a different room. When I didn’t see Matt that first day, I assumed that he had simply not come back; when he didn't see me, he assumed that I had never checked in. We’d been staying at the same hotel, one floor apart, for the entire three days and never realized it. Matt actually redeemed himself in my eyes and may have even proved to be the better friend. Whereas, I hadn't reported Matt’s disappearance to the authorities, he had apparently turned my name in to the U.S. Embassy. For a couple days, I was officially a missing person. That experience stuck with me for a long time and still mystifies me to this day. It was the first time – but not the last time – that I realized Prague has a way of messing with your mind. 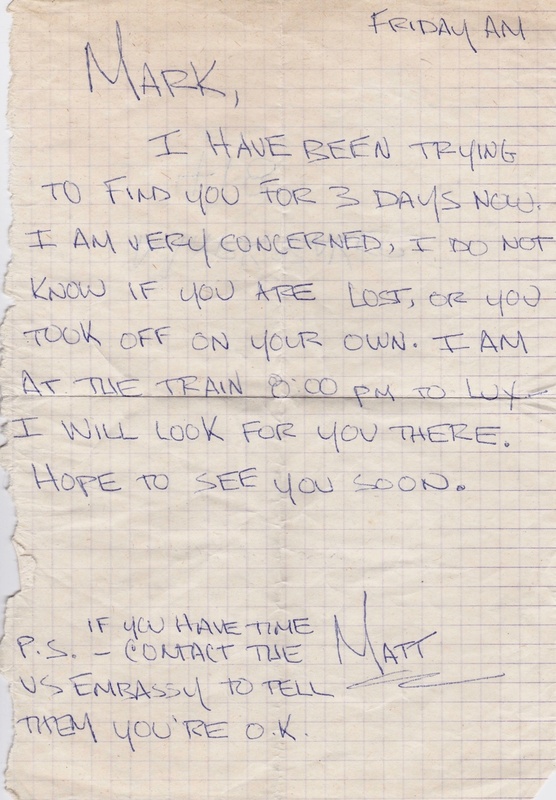 The letter that Matt left me at the hotel at the end of his stay. He was obviously as worried about me as I was about him. I'm still not sure how I ended up with it. 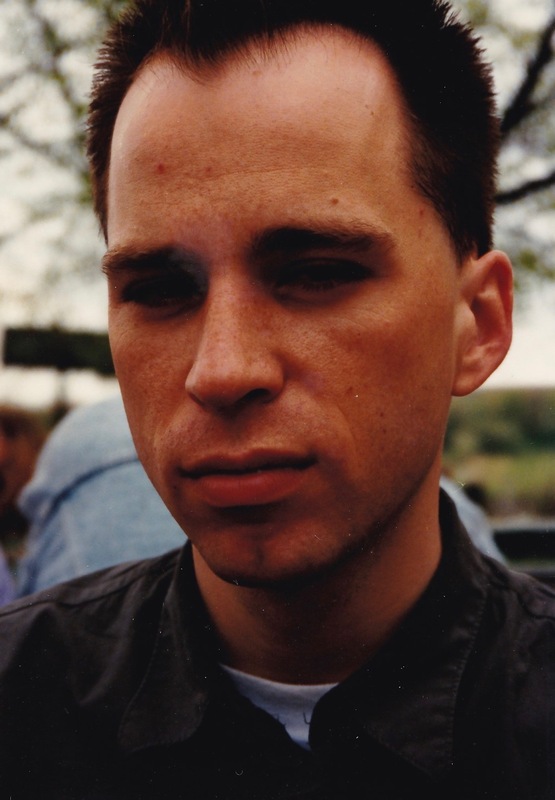 Matt, pictured in the 1980s. This is more or less how he appeared the evening when I found him standing on the platform of Prague's main train station. Photo credit: Ruth Raymond. Thanks for this. My first time in Prague was the same Summer – the LA Olympics’ boycott in full bloom. The city was beautiful but felt ominous, and I constantly made the wrong choice (like entering a bar where people like me were not welcome). At the same time, it was magical – filled with old women sweeping shopfronts with home-made brooms in the mornings, and shop windows opening up to sell some random article (pizza, ice cream, toilet paper) that I either wanted once I got there or didn’t and would buy for the person behind me. I’d buy a bottle of wine at the hotel bar (Opera, I think) and find old men to sit and share with in the evening. There was this strange worker’s restaurant on Wenceslas square where you could eat standing up for like 20 cents and get a beer for 5…it was beautiful and, I don’t know, foreboding at the same time. Hell, there was the giant red star on the hill. I’m glad that the people have better lives, but something magical and private – almost like something from The Third Man -has been lost. Yup, that’s the place. Such a beautiful city. I think I only ran into a couple of other Americans while there, other than at the Embassy where I went to watch 2-week old tapes of network news one afternoon. In a world without constant contact and access through phones and computers, it seemed like one could just disappear. I think back to sitting in a train station, waiting for someone I didn’t know to approach me about a room, following them somewhere I’d never been before, giving them money, and assuming that they wouldn’t murder me in my sleep with nostalgia for a more innocent time. Love the writing, by the way. Thanks for listening. Indeed I did! Thank you, Lisa, for leaving a comment and I’m happy you liked the writing! Thank you for sharing your stories, Mark, it’s fantastic to hear of your experiences & descriptions of Praha back in the 1980s. I was also there at that time, but annually on my family summer holidays over from the U.K. My mother is from Praha but moved to London in 1968, so we would take our summer holidays there to stay with my grandparents (Babi & Deda) in Praha. This was from when I was a baby in the early 1970s up to 1989 when I was a teenager, so my experiences were maybe more family-based – but we also traveled out of Praha to stay with relatives here & there in small villages & farms, and to the moutains to stay in big, mostly empty hotels – I remember those old dark green trains with the red star on the front, and the train toilets that flushed out straight down onto the track. “Do not flush when in the station”, I’m sure the signs said, hehe. I always felt it was such a special time, even with the restrictions there from the country being under Communist rule , but this maybe made it even more special. It will never be the same as it was back then (for good & bad), but of course Praha is still a beautiful, magical city. I am currently writing about the experiences my family had on those holidays – mainly for my children as they will probably never experience anything like that, and was doing some research on Wenceslas Square when I found your site, which was really helpful. Again, it’s great to hear your and other people’s experiences of Praha and Czechoslovakia at that time.